KidsEBookBestsellers.com: Kindle Kids Send THE VIRGINIA MYSTERIES COLLECTION into the Top Ten. Kindle Kids Send THE VIRGINIA MYSTERIES COLLECTION into the Top Ten. The Virginia Mysteries Collection hit the number 9 spot in the Children's section of the Amazon Kindle store on January 24th. Author Steven K. Smith calls his stories, "adventures with a twist of history." They are written for young readers, ages 7-12. Steven, let's start with a description of your book. 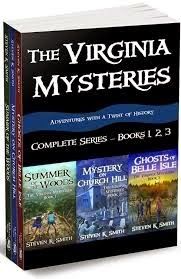 The Virginia Mysteries Collection is a box set of three mystery adventure books for middle grade readers. The stories follow brothers Sam and Derek and their friends on exciting adventures that often have a twist of history from local Virginia and American historical events, people, and places. The series has often been compared to the Magic Tree House and Hardy Boys books and the movies National Treasure and Goonies. Book One, Summer of the Woods, follows the boys as they explore the deep woods around their new home in Virginia. When they find some old coins in the creek over summer vacation, they begin a search for a stolen treasure from the local museum. Book Two, Mystery on Church Hill, sends the brothers and friend Caitlin on an adventure tied to the American Revolution. When they find clues at historic St. John’s Church, the site of Patrick Henry’s famous Liberty speech, the kids embark on a race for a hidden artifact before it falls into the wrong hands. Ghosts of Belle Isle is book three in the series, and connects the kids to the Fall of Richmond at the end of the Civil War. They explore former prisoner of war camp Belle Isle, famous confederate soldier resting place, Hollywood Cemetery, and run into a biker gang led by the notorious Mad Dog DeWitt. I decided early on to independently publish through my own imprint, MyBoys3 Press. I really enjoy the speed to market, the entrepreneurial spirit that comes with the process, and the opportunity to guide your own path. While there are still some inherent challenges with access to certain markets, mostly in print, I think the positives clearly outweigh the negatives. It’s been a fun process that I look forward to continuing for a long time to come! I try to get my books and name out there as much as possible. I have a website and blog, although the deeper I get into writing books, the less I find myself having the time to blog. I try to post things fairly regularly on Facebook, and I have a mailing list that I use primarily to announce live events and new books. My recent ad in Book Bub worked very well, and I’m always on the lookout for new ways to market my books. Selling in middle grade has some unique challenges, in that your reader group is always changing as kids grow older, and often it is the parents that are your actual buyers, so it takes a multi-pronged approach. I’m also increasing my outreach to local elementary schools in my area for events like book clubs, classroom visits and connections to librarians as a way to become more entrenched in reading choices for kids. Most of the parents and kids that I speak to in what I’ll call late elementary school (grades 2-5) that are reading on their own, are still largely reading print books. That said, I see a lot of online Kindle sales. While not a scientific study, but is also supported by conversations I’ve had with readers, I think this speaks to two things. One, there are a good number of adults that still enjoy reading middle grade books, and two, parents are finding out about new books on kindle and either reading them to their kids or passing them along. While I think it will be a while until paperbacks disappear, I think ereaders will gradually seep into late elementary school and early middle school age reader habits. As someone that has a very busy full time day job running a sales team in e-healthcare and three very active young sons, I try to fit writing in where I can, which is a lot less than I’d like. My schedule varies greatly from week to week, but I find that I go in waves of immersing myself in a book project a couple times a year and then have slower periods in-between. Right now I’ve just started a fourth book in the Virginia Mystery series and am also finding my way through a new book that will either be young adult or adult, which is a new challenge for me and so far a lot of fun. Learn more about Steven and his books by visiting his website, the Virginia Mysteries website or his blog, or by following Steven on Facebook or Twitter. See the latest Kids' EBook Bestseller List for more top ten e-format authors and their books. It's updated every Saturday morning. Check back next week when my featured author will be Carrie Anne Noble.